Enjoy that unique moment of making a big step forward into the future… Show your deepest feelings with a stunning GLAMIRA engagement ring. Beautify the symbol of your love with the most adorable precious stone and let the incomparable sparkle of diamonds win her heart. Let her fall in love with an engagement ring consisted of one of countless gemstones… Create the design you like most with her favourite colour. As an exclusive gift for your wedding anniversary or a marriage proposal in a special way… Opt for cabochon rings embellished with the beauty of precious stones to highlight your very special moments. BRIDAL SETS Special for brides-to-be! Brilliant solitaires and finest ring models are in company within our bridal set. Carry the reflection of felicity on your fingers! Wedding Set A marriage between jewels can be just as sentimental as a marriage within a relationship. Your wedding set will be the best companion for the special occasions. 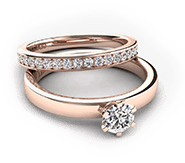 WOMEN’S WEDDING RINGS Women’s wedding rings that GLAMIRA proudly offers cover a vast selection ranging from modern style to classical ones to make a big splash for brides-to-be. MEN’S WEDDING RINGS GLAMIRA’s collection of mens wedding rings is produced with best quality metals that will last a lifetime and they also look gorgeous on your finger. There is nothing more exciting than getting engaged, well that is besides the wedding day. So Engagement Rings are most likely the best 'gift' to receive and give! How better to show you mean 'forever' when you give an engagement ring? But how do you choose it? Don't go from store to store looking for something off a shelf or inside a glass counter. Make your choice a dedicated one by creating the perfect custom and personalised engagement ring. You can choose your design from a multitude of rings and then choose your metal or metals, and then the diamond and other precious gemstones as you wish! Your Engagement is likely the most important decision you can make in life. Once you have made the decision to be together forever, you need to express that love in a way that shows the world that you care so much. So why show it with something that anyone else can buy? GLAMIRA will set you apart from the rest of the world with a customised and personalised ring. Your family and your friends will see for themselves the devotion to the one you love. A one of a kind romance is up to you! When selecting engagement rings for women there are many ways you can do it. You can't just go out and buy something. Anything? No. You have to show her that you cherish her completely and want to be with her forever. So you have to find the perfect ring to state that. Shopping online will give you the opportunity to find the design she likes and then you can go to work doing the rest. The size of the diamond, the type of metal or alloy. Accompanying gemstones to highlight the diamonds. How about engraving? A favourite verse of a poem or the date when you met. How about both your names etched in the metal forever? You can create the ring as you wish. Not to what someone else thought you might like. How about engagement rings for men? Now that's a wonderful way to start your life together! It may be traditional for women to wear an engagement ring but now even men can show that their “taken” to the world! GLAMIRA has many designs to chose from. Once you have picked a design, you can customise and personalise it as you wish. Metal or alloy, diamonds or gemstones. It's all up to you. Simple or extravagant... It is all yours to design and at GLAMIRA, it is all just a few clicks away. Build something that will live on forever! It is fun and quite easy to design your own engagement ring. The GLAMIRA website is set up to pick a basic design, then you can choose the metal and finish. Pick the size and cut of your gemstone or diamond and then add the finishing touches. Maybe engraving a name or quote, or anything you like. Once you have finalised your design, proceed to the check-out and in a short time, your ring will be delivered to any address you choose. So you are getting closer and you want to show her that you'd like to be even closer. So there is no better way to say that than with commitment rings. A less formal yet strong statement of your feelings to the one you love. Make it something special to to say that you care by personalising it with engraving or any precious gemstones you like. A promise is a promise and a ring is a ring. However promise rings are the best way to share a promise. GLAMIRA has a wide variety of promise rings available to customise and personalise for you. It is as easy as a tap of click to start creating the perfect ring that says “I promise” to the one you love. 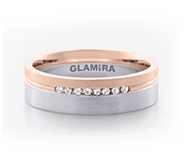 When you do give your special one a promise ring, you can be assured that the GLAMIRA promise of quality and satisfaction is assured with your purchase. It is a huge question, and that's maybe why we “pop” it! A Proposal of marriage is a major life event. It is most likely the one question that has the biggest return on happiness. A lifetime of bliss and love awaits the recipients of the reply. But don't go empty handed! If you're going to propose you'll need to back up your question with an engagement ring. 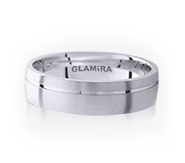 So finding the right ring for the right time and place, GLAMIRA is the place to start. Any budget and any style is available. From large diamond rings to modest designs. You can create any ring you could imagine. The choices are all yours. A wedding takes a lot of time to plan. So why spend all that valuable time searching for rings? You can create the perfect ring right from the comfort of your own home. Or, even at the corner cafe. It is all when and where you want to make the perfect ring for the love you will share forever! Your wedding will no doubt be so much easier to plan knowing that you got your rings designed, ordered and custom crafted for your big day. No worries on driving around to select them, get them sized, and then pick them up again. Just with a few clicks or taps your rings will be delivered in just a short period of time right to your doorstep! A wide selection of base designs are available for spectacular diamond engagement rings from GLAMIRA. Diamonds of any shape and size are available for you to choose from. Match them with a ring and setting with other gemstones or just alone. With GLAMIRA, it is all up to you to create a truly beautiful work of art that you can wear for a lifetime. Want to do something just a little different? Are you the quirky one that was always the black sheep? How about black diamond engagement rings as an alternative to regular diamonds? A stunning range of ring designs combines with a setting of black diamonds will definitely make everyone make a double take at your engagement ring. Looking for a more colourful arrangement of gemstones? How about gemstone engagement rings that can say it with style and colour? There is a rainbow of colours waiting for you with gemstones from around the world to be placed on your customised ring. Sapphire engagement rings bring the colour blue to your ring finger. Elegant and regal, a sapphire is a wonderful expression of happiness and love. As deep as the oceans and as high as the sky. Blue sapphires are a feast for the eyes and anyone who sees them will be amazed as to how beautiful sapphires can be. As green as the forest and the sea, Emerald engagement rings bring nature to your setting. An engagement ring with emeralds is a wonderful way to say I love you with colour! You choose the size and cut of your emerald and then you can even customise it further with the metal and other gemstones of your choosing. When it comes to gold, you can always make your unique statement to the world with white gold engagement rings. White gold is one statement of design that shows your strength and being white hot with white gold is exactly that! Your unique style showing through the crowd! Tried, tested and true. Yellow gold engagement rings have the right stuff to make your dreams come true. Dreams of not only a wonderful lifetime together with your partner, but also showing the tried and true yellow gold engagement rings that have adorned wedded fingers for millennia! Looking for a less subtle metal for your engagement ring? How about rose gold engagement rings to set your pulse on high? Rose gold is an alloy that not only takes gold to the stratosphere, it also matches with so many precious gemstones like sapphires, rubies, and emeralds. There is only one precious metal more rare than gold. When you choose platinum engagement rings you are choosing most likely one of the most precious metals used in jewellery. It's structure is not only perfection, it gives any setting an amazing backdrop of class and beauty. Platinum is a resilient metal that won’t bend or break under almost any circumstances. A Solitaire would likely be the most popular engagement ring there is. One love for eternity, one diamond to show it. Many designs are available from GLAMIRA and once you've decided that it will be a solitaire, you can then choose from many precious metals and finishes. The size and cut of the diamond is up to you. Matte or high-lustre polished metals can all be chosen for your custom and personalised ring. When you marry it is forever. So why not choose Eternity engagement rings for you or your love's ring finger? Eternity rings are a wonderful way to prove that your love is forever. There are many different designs to choose from the collections on the website and as always, you can customise and personalise your ring as you wish. If you are going to say it with an eternity ring, you can ensure that GLAMIRA will help you create a one of a kind creation. Halo engagement rings are rings with a centre stone and then that is surrounded with a lovely cluster of diamonds. GLAMIRA has a wide selection of halo engagement rings for you to choose from. Once you have selected your design, you can then pick the size of the main diamond and the halo diamonds. Of course, you can select the metals and even have it engraved to personalise it to your wishes! 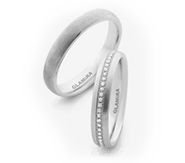 When you want to remind your love that you are never going to tire of saying I love you, why not choose a design from GLAMIRA's diamond eternity rings collection? Once you have found the design you like, you can then personalise it with many different options. Metals, gemstones, engraving. All are available to choose from. When selecting a diamond, the unit if measure is the carat. Diamonds are also cut in different shapes making them all unique to themselves. So when you select a diamond, size matters! The larger the diamond, the more intricate the cut can be. The diamond cut is how the diamond crystal is shaped. Each and every diamond requires a skilful eye and hand to shape the diamond. Depending on the shape of the raw diamond, the expert will make the largest possible diamond from it. The shape also determines the internal reflective qualities making some diamonds brighter than others. The round / brilliant cut, is the brightest cut of any diamond, as when light enters it, the internal surfaces reflect upon each other making the diamond shine brightly when viewed from above. No matter where the light comes from, the diamond will shine forever bright. When choosing a diamond, the size and cut are not the only things to consider. The diamond colour and clarity are also important. The colour can range from clear to black and the clarity is how clear the diamonds can be. Some diamonds may have a cloudy appearance and GLAMIRA ensures that the diamonds on your ring are to the standard you deserve. When choosing an engagement ring, why not check the wonderful selection of princess cut engagement rings from GLAMIRA? If your romance is something out of a fairytale then you should consider something that is just as lavish and regal! Ever wondered about cushion cut engagement rings? Cushion cut engagement rings are very popular amongst those that prefer rounded edges. You can select from a wide assortment of designs and then customise the ring to your specifications. Size of stones and the type are all up to you. Why not treat yourself to something different by choosing one of the many emerald cut engagement rings available from GLAMIRA? Remember, your dream ring is only a click away!